It’s new collection of Sequins Work Lehenga Style. 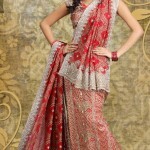 It emphasis the beautification of not only lehengas but every kind of fabrics. The fashion of sequin on clothes is classical and vintage trend that has been given fashionable trimming according to the requirements of this current age. This lehenga choli is connected to some specific region of a country and it can be used as a sign of some culture and tradition of a nation. This sequin work is in broadening shape and has long lasting impression on its beholders. Blue and hot pink is no doubt hottest contrast but the embellishment of sequin work on it is making it superlative and bravura for fashionable girls who want to keep pace in this fast running fashion race.